The time trial! If Froome or Dumoulin were here, we would be looking at them! I believe this is truly a course that favors pure time-trialing. Wide, clear roads, with very few radical turns, only the occasional roundabout, and flat. It finishes at Complejo deportivo Oscar Freire: The Oscar Freire sports complex! At approximately 800 meters from the finish there is a 180' u-turn as they enter the sports complex. A 90' right-hander about 2-300 m from the line, then straight to the finish line. With 490m of altitude differences, the numbers are comparable for example with the one in this year's Tour or the first one from the 2017 Giro (although shorter now). So it's not steep, but enough to break the rhythm. The startlist is available here. Torrelavega is where this guy is from. Campanaerts or Dennis, but in between the GC riders - who's to say what is going to happen. but, this is the real but ... which Lopez is here? There is the guy who lost mucho time in the Giro time trial, and the other one who beat Cancellara (!!!! yes, Cancellara C-a-n-c-e-l-l-a-r-a) in f#"¤"#¤ Tour de Suisse! Lopez' best stage to date ? Behind we can also see Kelderman, Thomas, Castroviejo, Bodnar and a few other more than decent time trialists. However, I I fear it is going to be the first guy, the one who lost time in the giro that is here.in which case he might justaswell wave bye bye to the ugly wheel-like dinner plate trophy. Quintana, Yates, Kruijswijk are all climbers that can do good time trials - but I don't think they will score >30 secs on important opponents. basically all good results Campenaerts has are from early-stage or one day races. Only 11th in the Giro this year, 5th two years ago in the Vuelta. And now he is also still suffering a bit from the crash a couple of days ago. The competition is not super strong, and he looked really good so far in the road stages, but I would be surprised if he really is able to contend for the win. Aha, so -- according to search and Porte, I got the "flat" part wrong -- that's what one gets for relying on published profiles and Google maps. The BMC Racing Team Australian stars Rohan Dennis and Richie Porte went to reconnoitre the course together this morning. Porte commented: "You get a Rohan Dennis course, down to the ground. Any course is a Rohan Dennis course at the moment. He's on great form. He's obviously very motivated for this stage. He's the favourite. It's quite bumpy but it's fast. It's a nice time trial. I believe it'll be won in the high 40's (km/h). It's pretty hilly there with about 500 metres of climbing. That'll make it hard to reach 50km/h average. The start is for sure the hardest part." Rohan Dennis will start at 15:10 and Richie Porte at 15:32. 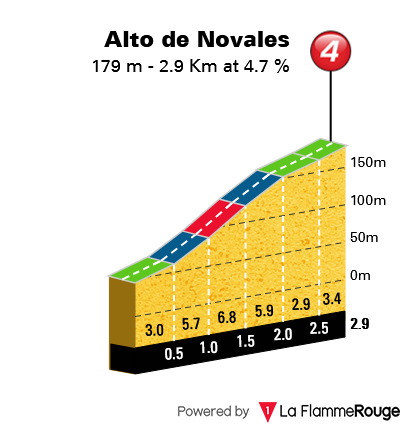 Jonathan Castroviejo (Team Sky), another contender for todays' stage, starts at 15.07. Also, notice it would seem like BMC is tipping Dennis for the stage, over Porte - to address the question posted above. Lopez comes off quite the worst in that little comparison, eh? Surprisingly good ride with an extremely hard start by Kruijswick, even if he clearly faded towards the end. Wonder what that is going to cost him in days to come. Also a very good ride by Simon Yates. Now he really starts to look like the next Grand Tour winner. I guess it is only Kruijswijk and Mas that can get him that doesn't already have a red jersey in the their wardrobe. I am very disappointed by the Colombian time trial performances, or I still don't get how they pulled of their amazing rides in the past. Now they are loosing mucho time all of them, just as we'd expect if we hadn't seen Uran in the vineyards timetrial in the giro 2014, where he won by 1:14, or#astana Lopez in the Tour de Suisse. I actually think Quintana was the closer to his own personal best - but that isn't good enough here. GC riders need to practice on the that ugly bike too. Also a very good ride by Simon Yates. Now he really starts to look like the next Grand Tour winner. . . Massive disappointment with the Columbians aside, I think Yates has just put himself odds-on favorite to be in red in Madrid. Kruiswijk was magnificent, even if he did make a major pacing mistake. Great to see Yates extend his lead in red, Mas was a surprise there as well and most certainly a contender for the podium in Madrid.